The RCD-2V specializes in moving disabled or immobile vehicles, so free up your work bays with this chassis-mount vehicle dolly. Heavy-duty 114 mm nylon casters feature lockable swivel casters with precision ball bearings for effortless mobility, even across air hoses and uneven floor surfaces. The Ranger RCD-2V mobile vehicle wheel dolly and support stand allow disabled or wheel-less vehicles to be effortlessly rolled forward, backward or sideways, improving workplace productivity in garages or workshops with space limitations or restricted driving lanes. 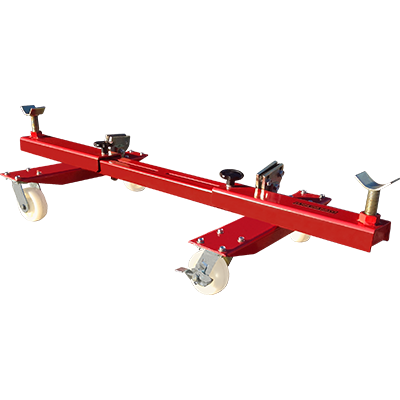 Whether you’re working on a disassembled drive train, a stripped vehicle chassis or simply a car waiting for parts, a set of RCD-2V car dollies allows you to place it anywhere in the shop and out of your way. It fits most vehicle models and years and adjusts from ​254 mm to 323 mm in height and ​1035 mm to 1499 mm in width. ​Each RCD-2V car dolly has a 1996-kg. weight capacity and features pinch weld clamps and support saddles for easy vehicle loading and adaptation to most vehicle makes and models. Heavy-duty 114 mm nylon casters feature lockable swivel casters with precision ball bearings for effortless mobility, even across air hoses and uneven floor surfaces. Two units are typically required for complete support of cars and trucks. Sold individually.